What is a week-end? Come and find out! 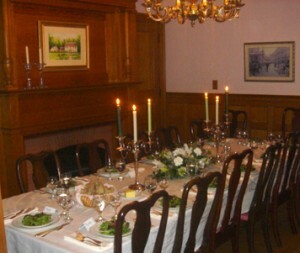 The dinner on Saturday night will be an etiquette dinner which takes you from the dressing gong to after-dinner chocolates while everyone takes a turn at being both guest and footman and the intricacies of proper Edwardian (and modern) dinner etiquette are explored and explained. There will be a proper English afternoon tea at which you may come in the “character” of any character, though dressing the part is entirely optional. Breakfast will be just what you would expect with a sideboard buffet and strawberry jam, orange marmalade or lemon curd for your toast which will arrive in a proper silver toast rack. Optional activities include fly fishing (though it’s not Scotland), horseback riding lessons (sorry ladies, sidesaddle is not possible), crewel embroidery lessons, and chocolate-covered truffle making with someone much less grumpy than Mrs. Patmore in the kitchen. There will also be games and puzzles to enjoy throughout the weekend. The Downton Abbey weekend rate starts at $295 per person plus tax double, $335 single, or $280 each triple, and includes two night’s lodging with full breakfast each morning, full English afternoon tea, dinner with the etiquette talk and some activities. There is an extra charge for horseback riding and truffle making. There is no charge for fly fishing, but it requires a Vermont fishing license which is easily obtained online. There is no charge for crewel embroidery instruction, but you must provide your own materials.